I love s'mores! I love popcorn! So why not combine the two? Today I have a quick and easy s'more popcorn ball recipe that is delicious. With all this cold weather coming in, sweet treats really help make the day better! They are also great for holiday parties! Place your popcorn into a large mixing bowl. Set aside. Crush your graham crackers into small pieces and set aside. In a medium size pan, melt your butter. When butter is melted, add marshmallows and stir until completely melted. Then pour over your popcorn. Mix until popcorn is evenly coated with marshmallows. Add in your chocolate chips and your graham crackers. Stir until everything is mixed in well. The next step is messy. To keep your hand less messy its best to spray them with non-stick spray. Now, with your hands, form the popcorn mixture into balls. Place the popcorn balls onto a tray or plate. You should get between 6-8 popcorn balls depending on how big you make them. Let sit for about 30 minutes to cool. These popcorn balls are sooo yummy. They are great to make if you are going to a party or just to give to someone as a gift. I hope you all try this. It doesn't take much time and they are delicious. 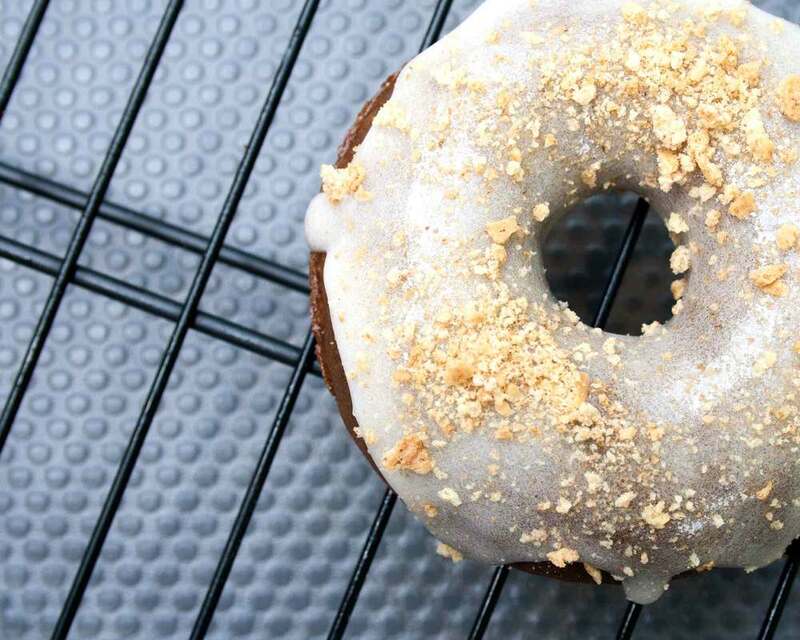 As much as we've already told you we love donuts, we love s'mores just as much! So in honor of National S'mores Day (8/10), we decided to bring you an awesome combo of those two things! We started off using this recipe that we recently found to make our chocolate donuts. We have a donut pan that we put our batter into. (If you prefer to make the donut holes you can just use a mini muffin pan, like it lists on the recipe.) To make it easy we spooned our batter into a gallon plastic baggie and cut off one corner to squeeze the batter into the pan. This gives you better control of how much goes into the pan and helps keep the batter smooth in the pan. Once we our donuts cooling on the rack, we started on our marshmallow glaze.